"Hold your breath. Make a wish. Count to three." I was saddened to hear the passing of Gene Wilder, aka Willy Wonka this week. The last thing I say when I close out my lectures Chats is a quote from the great Willy Wonka. "Come with me and you'll be in a world of pure imagination. Take a look and you'll see into your imagination. Living there you'll be free if you truly wish to be." A new adventure is coming to The Raspberry Rabbits in 2017. Something fun and different. A creative journey filled with the creations from two friends from two different countries. We hope to inspire you and lead you down the rabbit hole into your imagination. More information will be coming soon. Until then, I leave you with a little tune from the great Willy Wonka. Well hellooooooooo! Boy oh boy did I ever have the most fun in Chicago!!! I left at 6:00 a.m. on Sunday and got home at 12:30 a.m. this morning. Whew! What a whirlwind, but a fun one for sure! 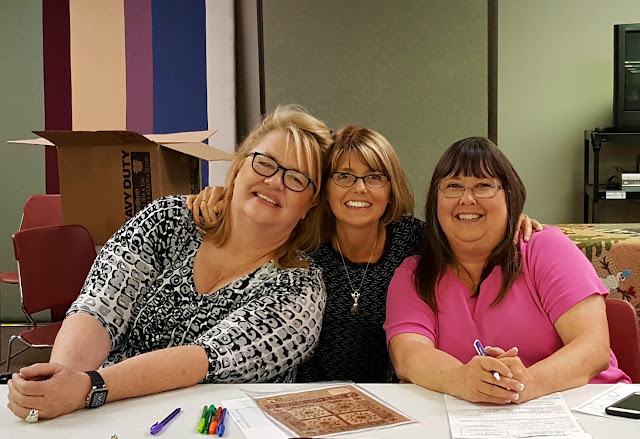 I was invited by these two fabulous ladies, Teresa and Chris (my new forever friends!) to give two chats and have a play date with their guild. The quilt above is their guild's raffle quilt. Isn't it gorgeous? Teresa and Chris are simply the best! I felt like I had been friends with them forever already and they spoiled me rotten. Chris took me to her house and showed me all sorts of quilts and goodies she has made. Fabulous! Also, I had hair envy as I have always wanted to wear my hair like hers and it never looks right on me. Chris also drove me around so I could house gaulk at all the gorgeous homes in the Saint. Charles and surrounding areas. OMG!! If it wasn't for snow, I could totally live in this place. To me it is a picture postcard perfect for "America." Here we are at our Play Date. Everyone doing bunny ears. hee,hee,hee. They did such a great job and everyone was really happy at how far they got in one day. 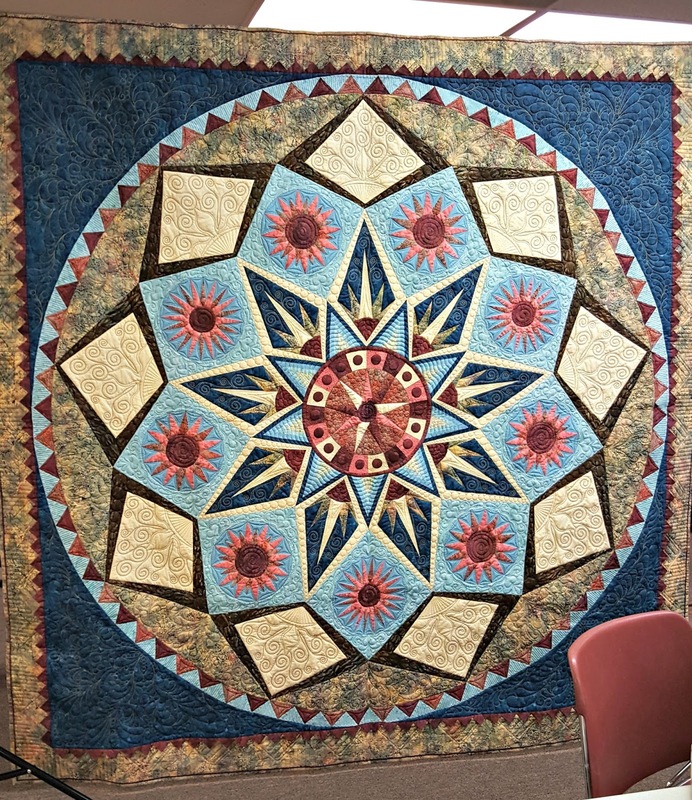 This is another raffle quilt from a nearby guild. Pretty! All those points make me crazy. I'm not good at piecing at all. Here is the day group showing off their pumpkins from class. Yes, their guild has almost 300 members so they have a day and night group. 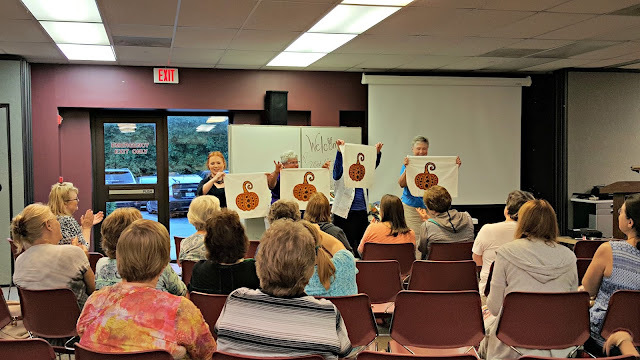 Here is the night group showing off their pumpkins from class. The next few photos are from their show and tell. One day I will remember to bring my big girl camera and not just have my phone, but you get the idea. Another absolutely wonderful thing about my trip was meeting a long time blog follower and wonderful customer in person. This is my friend Stephanie! I was so excited to hug her neck. She drove in and visited the guild just to hear my chat and meet me. Happy bunny dance!!! It was so great to meet you Stephanie!!!! 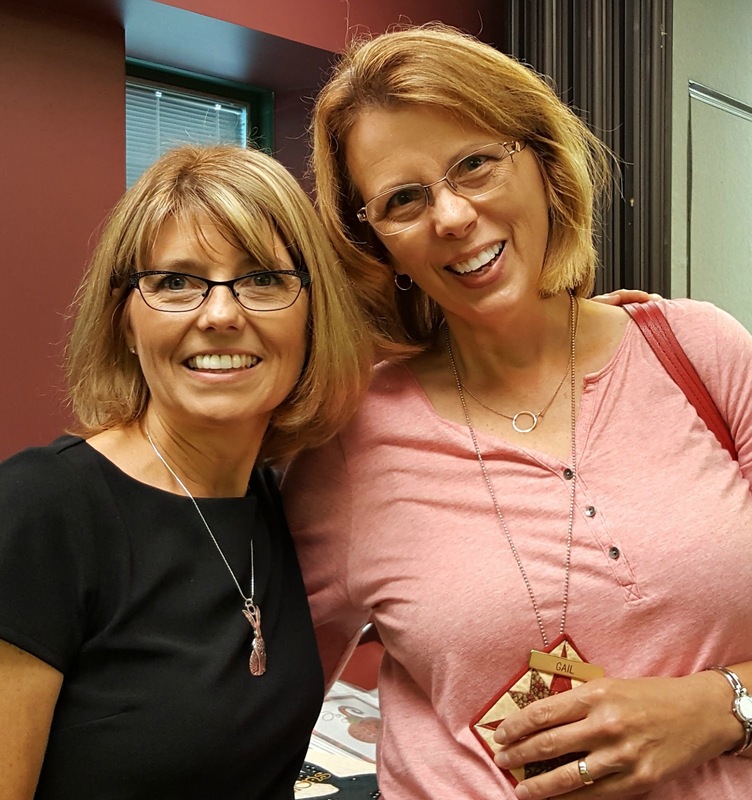 This is another sweet friend and customer, Gail. She belongs to the guild and I got to hug her neck and also meet her wonderful mom. 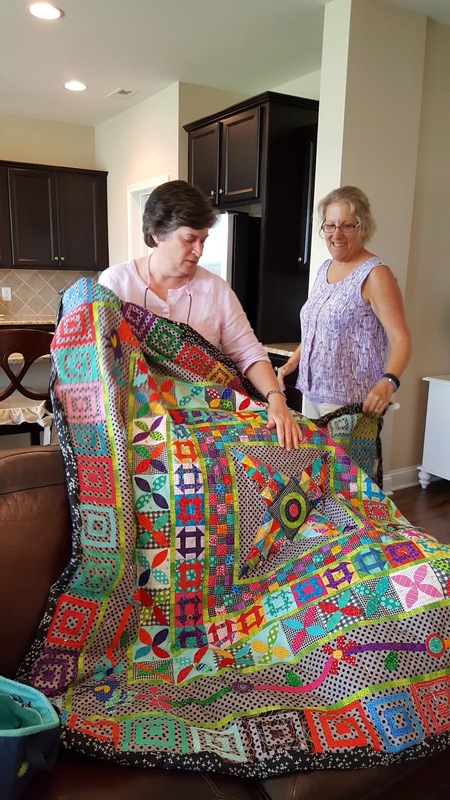 They hang out and quilt together. Fun! So great to hug your neck too Gail! Chris, Teresa and Hannah took me to three quilt shops in town. Yes, aren't you jealous that they have three right near them? Wow! The first shop was Sew Generously. Karin, the owner, is so nice and I also met Lydia who works there. Check them out if you are in Saint Charles. They are also the Bernina dealer. 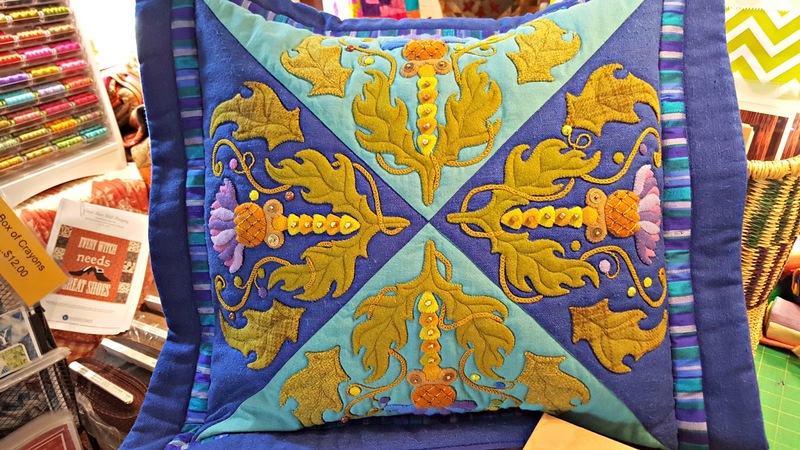 The shop is bright and cheerful with lots of beautiful fabric. Then we hopped on over to The Quilt Merchant. Valerie is the owner of this shop, which is filled with lots of civil war and warm earthy colors. More primitive in style. It is a gorgeous shop and Valerie is French so it was fun listening to her accent. Super nice lady. Hop over and visit her if you are in the Winfield, IL area. 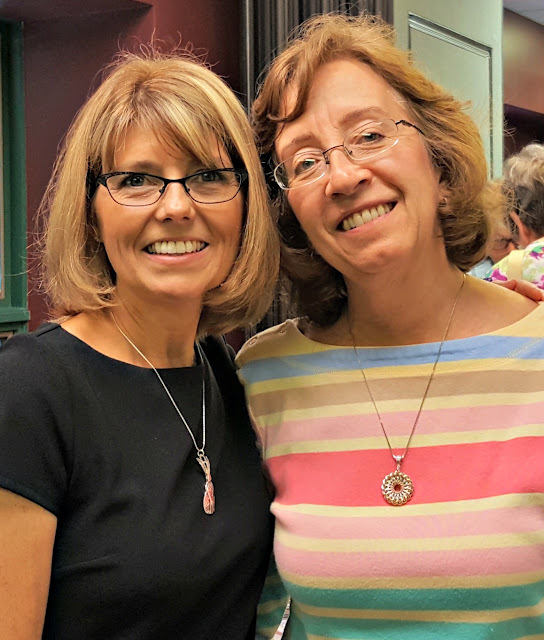 Next, I got to meet this lovely lady, Lynn Schmitt of A Different Box of Crayons. All I can say is WOW!!! Lynn is also an interior decorator and brings her eye for interior design into her work. 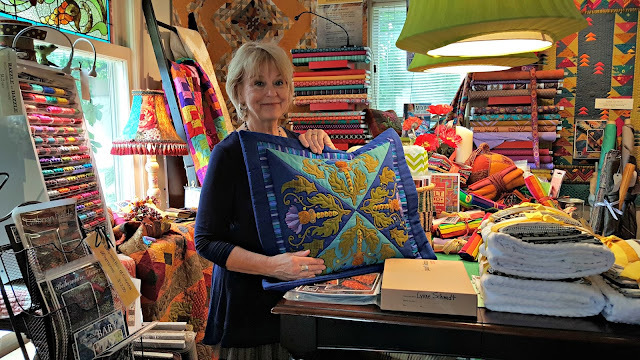 She has a small shop that is also her studio so you can see what she is working on when you visit. Check out this pillow! It has silk and wool! Lynn mixes all sorts of textiles in her work. She has a book coming out through C&T publishing next year where she will teach you methods on putting these different elements together. It will be going on my bookshelf for sure! She vends some of the bigger quilt shows, so keep an eye out for her. 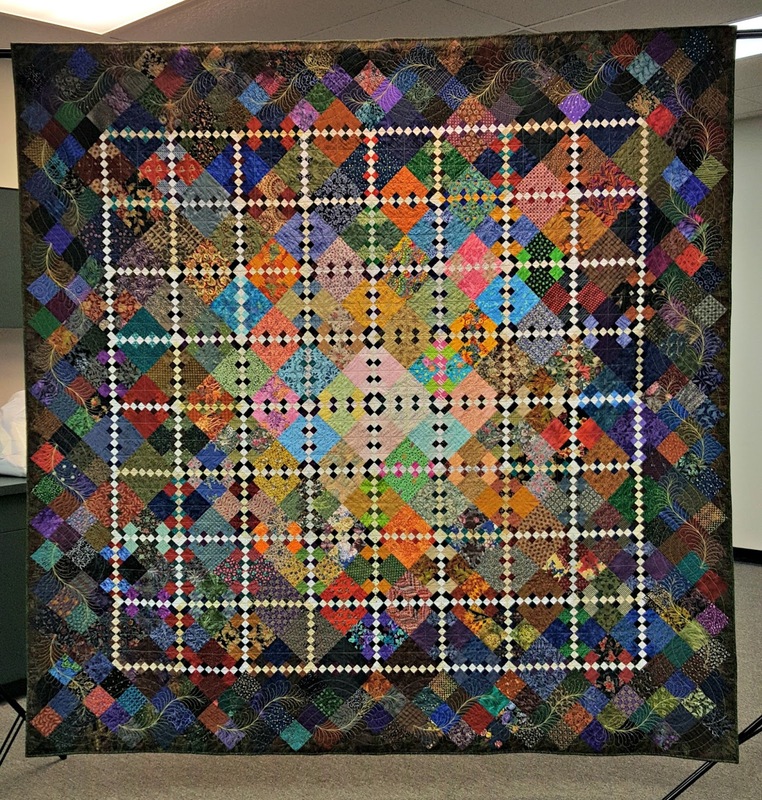 This quilt below had lots of dupioni silk in it along with wool. 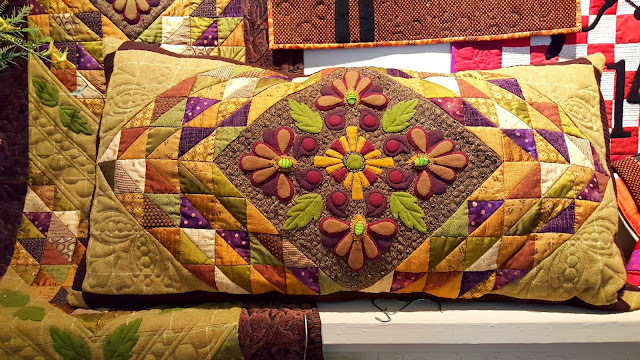 The quilting was gorgeous. This quilt was also gorgeous. The stars were put together in rows so you don't have "Y" seams. The dark brown fabric in the second border is actually home deck fabric that is fuzzy. What incredible texture! You can hop over to visit Lynn at her website HERE. 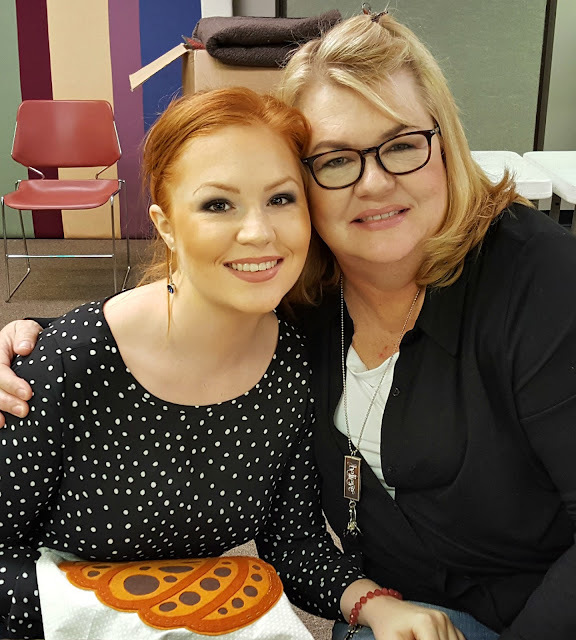 She will also be opening a new shop soon, which will be fabulous and she will be teaching in Italy next year with her pal, Renee Nanneman of Need'l Love. Well, like I said at the beginning of this post, Teresa and Chris spoiled me rotten. I love them to bits and I am so excited that I got visit with them and all the wonderful, kind and fun members of the Prairie Star Quilters Guild. Hi ya! Running a little late with my post today. I am neck high in the middle of the new website. Boy oh boy do I have a ton of new technology to learn. Makes my little bunny brain hurt! hee,hee,hee. It should be ready in the next few weeks. In the meantime, I am working on giving this little ol' blog a face lift too. I'm sooooooooo excited to show you the new website and I can't wait for you to see all the new things coming in 2017. What an adventure we are going to have! 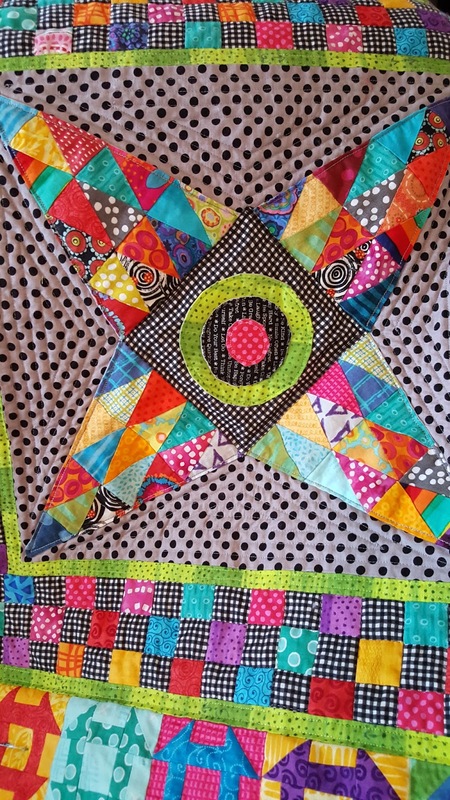 So today, I wanted to share some quilts from two of my friends. First, is this original design from my friend Brenda Rigdon in Michigan. I love it!!! She worked really hard to get this quilt done for the quilt show. She had many a "marathon sewing hours" to get it finished up. You may remember me talking about Brenda back in May. 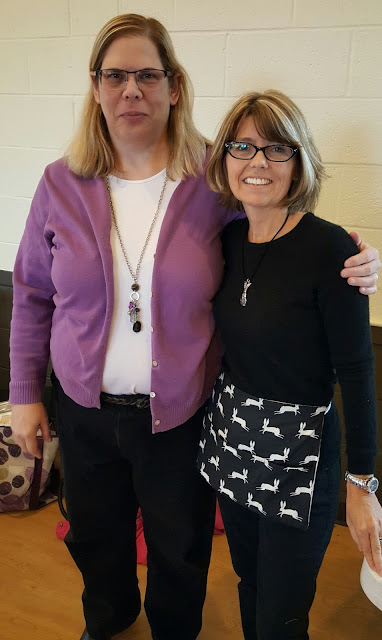 She has been a long time follower of my blog, but I got to meet her in person hug her neck when I taught at the Thornapple River Rippers Guild back in May. 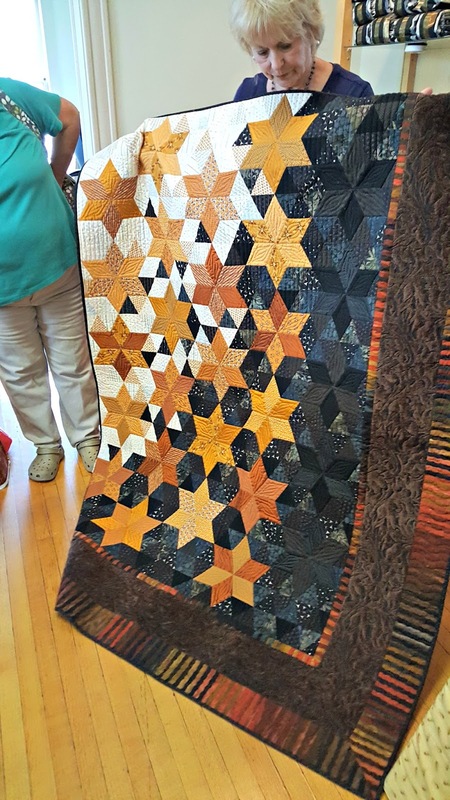 She told me the details and showed me parts of the quilt when I met her. I knew it was going to be fabulous and indeed it is! Great job girlfriend! 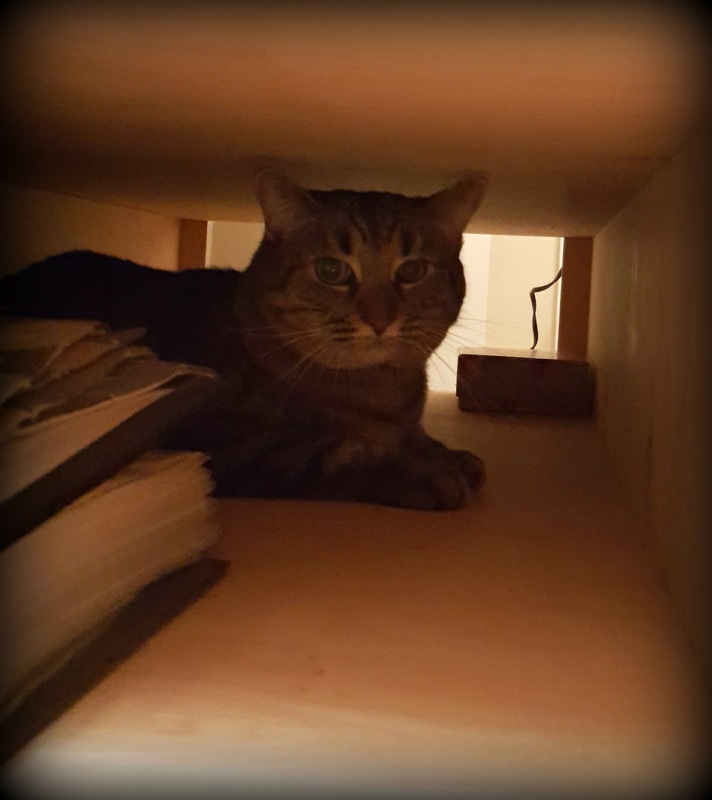 Don't you just love her cats? Next, I wanted to share a quilt from my local sewing group friend, Molly. This girl loves some color and belongs to the Modern Quilt Guild here in town. This quilt was part of a challenge from that guild. Molly is on the left and my friend, Jean, from last week's story on the right. Molly is a retired air traffic controller. Cool huh? Well my friend, this little bunny needs to get back to paperwork...booooooring!! I'm headed to Chicago on Sunday. 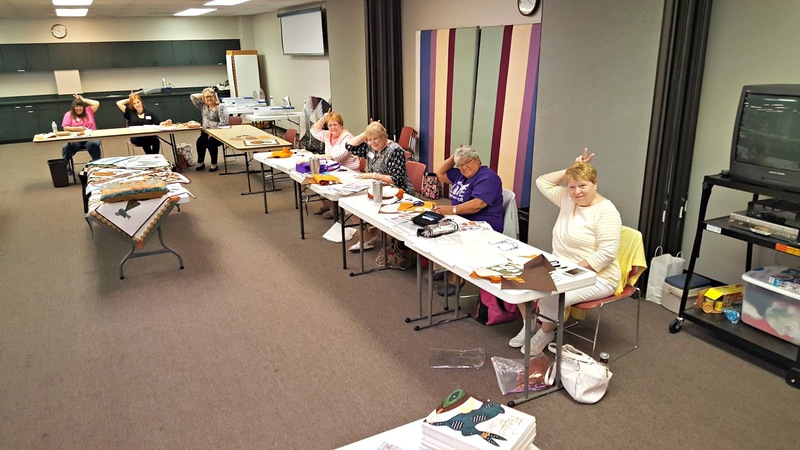 I have two chats and a play date with my friends at the Prairie Star Quilters guild. I'll be sure and take lots of photos to share with you next Wednesday. Until then, light, love and hugs to you! And it whispered, "Please finish me"
I've been a bit overwhelmed with chaos and sad things lately. My website crashing and dying right in the middle of it all hasn't helped. Not to mention, the stress of having to "make money" to pay for all this new technology, is an absolute creativity killer. It drains the inspiration right out of me and makes me question as to whether I should just throw in the towel on all of this and go get a job at Starbucks. "Would you like an extra shot of espresso in that?" hee,hee,hee. 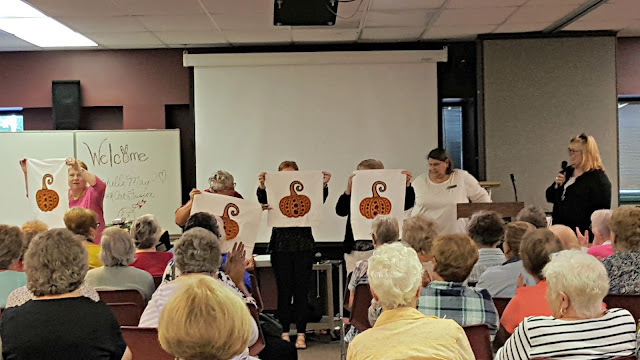 A couple of weeks ago, my little stitching group came over to my house for our weekly visit. 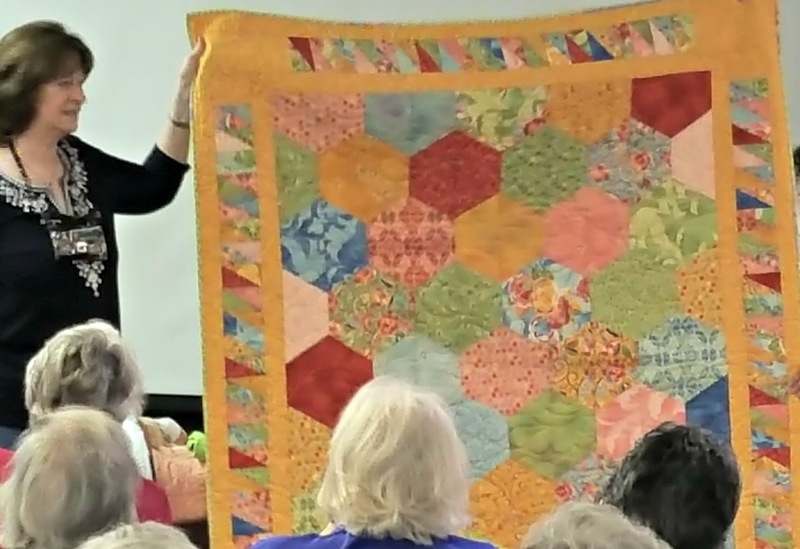 My dear friend, Jean, works in a local quilt shop and said a lady, named Tammy, had called and asked if there was anyone who could finish a small quilt her mom started. 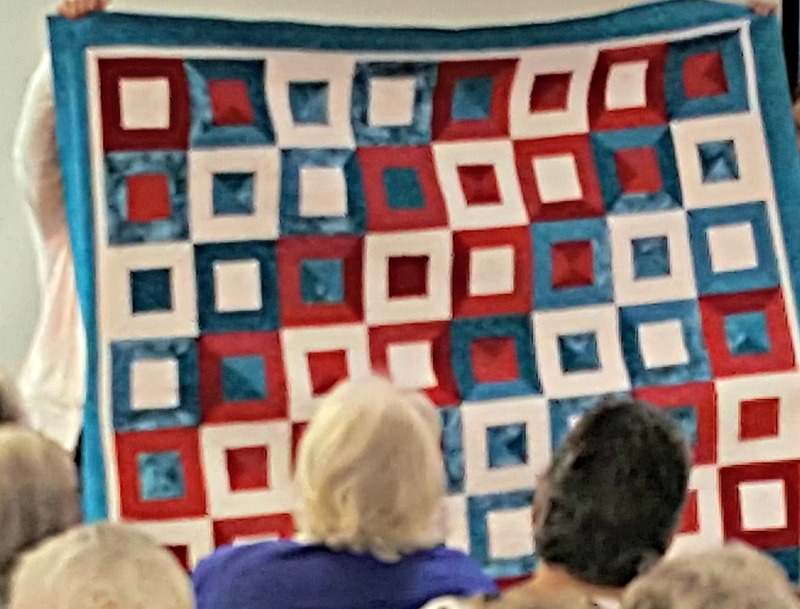 Jean asked around the shop and then gave her the number to our quilt guild. Jean told Tammy to call her back if she didn't hear from anyone. Well, as you can imagine, nobody called. Jean told Tammy to go ahead and bring the quilt to the shop. She would take it around and ask some of her other sewing friends if they would finish it. 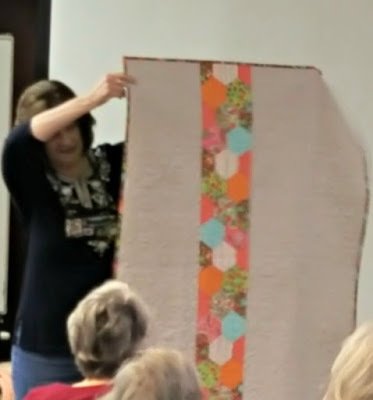 Tammy brought the quilt to the shop and all the gals there stopped to admire it. It had been hand completely hand stitched and hand quilted by her mom. 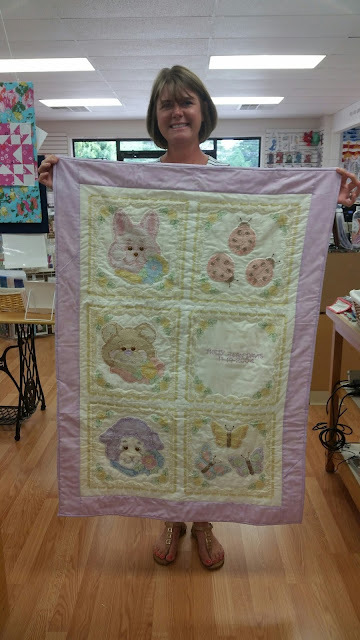 The gals at the shop said it really should have a border on it, so they helped Tammy pick out a soft lavender fabric that would accent the blocks. 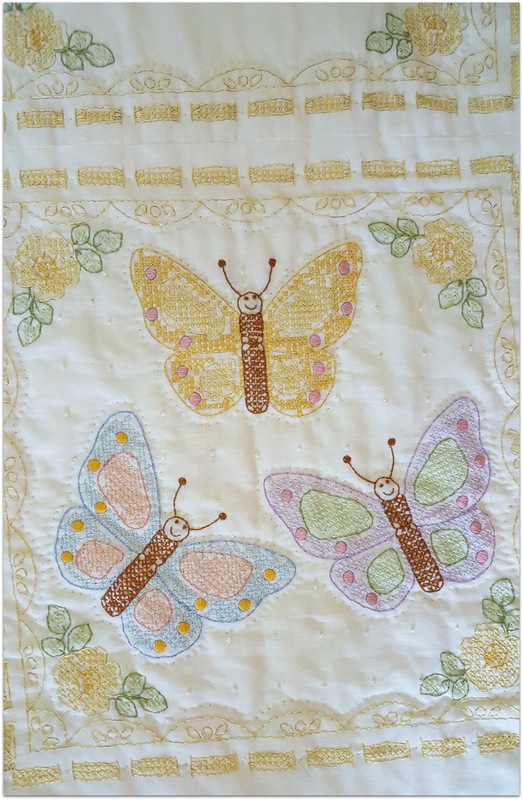 The tricky part would be adding this border to the quilt since it was already quilted. 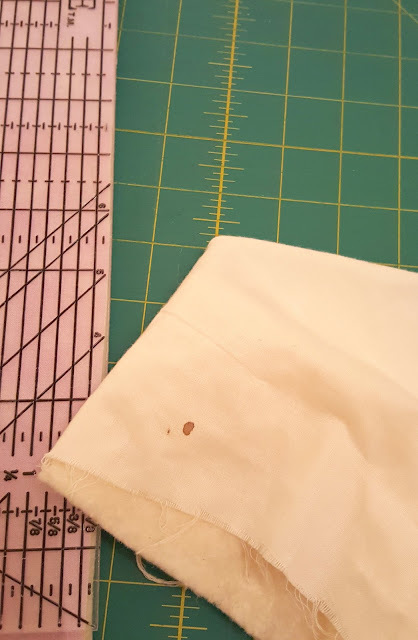 However, there was jsut enough fabric around the edges to it. So Jean brought the quilt to our little stitching group. 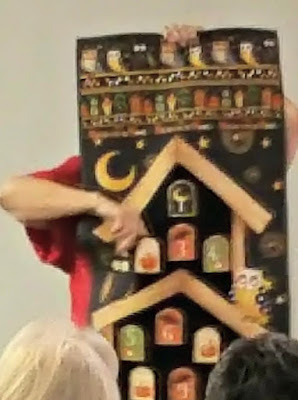 She pulled it out and told us the story of how nobody would take on the project of finishing it. 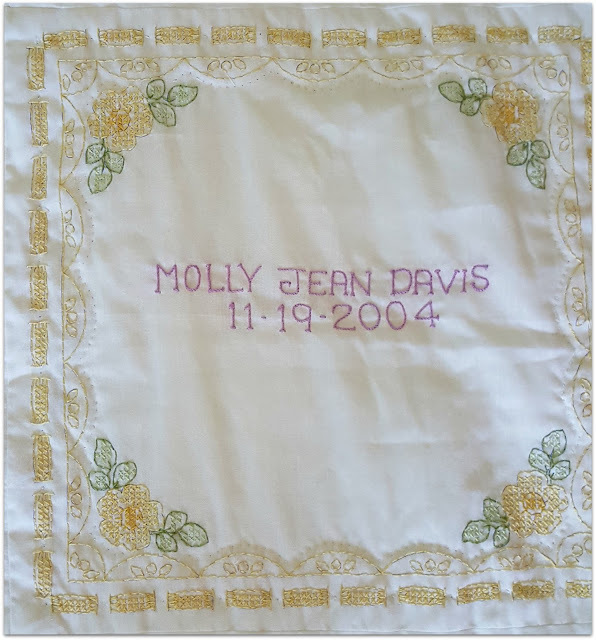 My friend, Molly, said she could probably do it if Jean couldn't find anyone, but it would be a few months as she had many things on her plate. 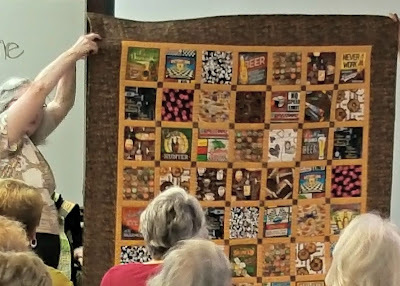 While Jean is a talented garment sewer, she is not a quilter and didn't feel comfortable taking on the project herself. I sat there looking at the quilt in awe at all the work that had gone into it. 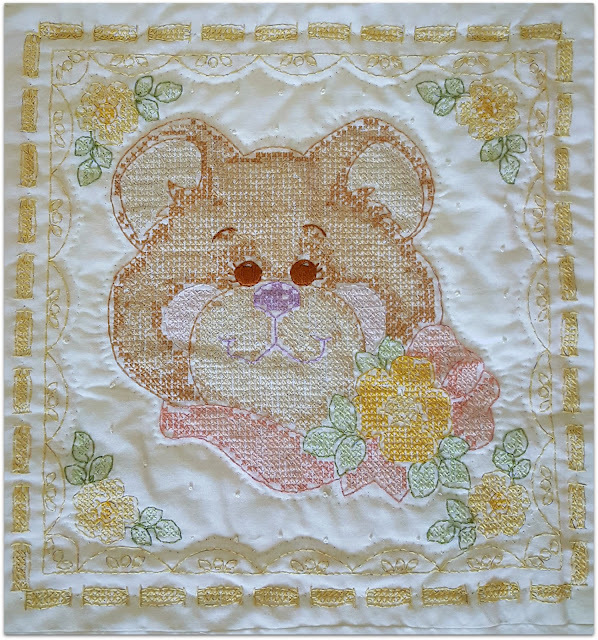 All those hours and hours of cross-stitching each block. While I wanted to help, I said I couldn't do it as I had absolutely no time, not to mention I was totally stressed out and needed to be spending my time designing new projects so I could pay for my new website. 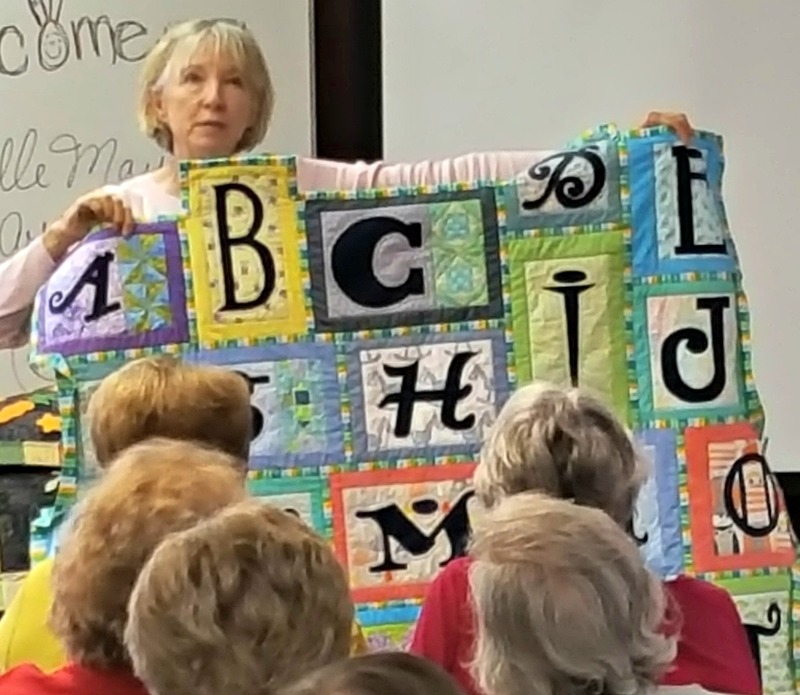 Everyone understood where everyone was coming from and Jean put the quilt back in the bag. We finished up our little visit and when I was tidying up, I noticed Jean had accidentally left the bag with the quilt in it. I texted her and let her know. She said she would pick it up in the morning. Well, that quilt kept whispering to me, "please finish me." Around 8:00 that night, I pulled it back out of the bag and brought it up to my studio. I sat down and looked at every single block and then suddenly, I took a long look at this block. There was so much meaning to me in that one block. 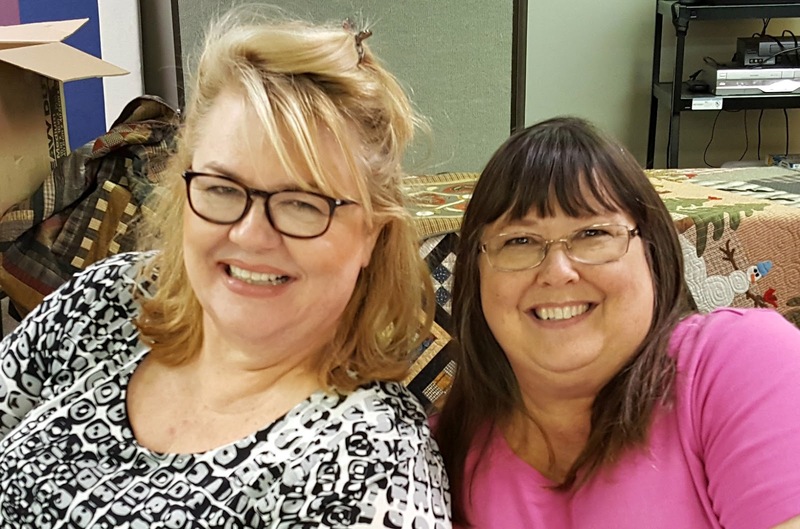 First, my two sweet friends from my new sewing group, Molly and Jean. Second, November 19th was the day my beloved grandpa passed away in 1997. Third, I adore and am totally intrigued by Chinese astrology and this little girl was born in 2004, the year of the monkey. I too am a monkey and not only that, but 2016 is the year of the monkey again!!! Then, something really special happened. Sabrina came upstairs and crawled into my sewing table cabinet and laid down. She has never done that. 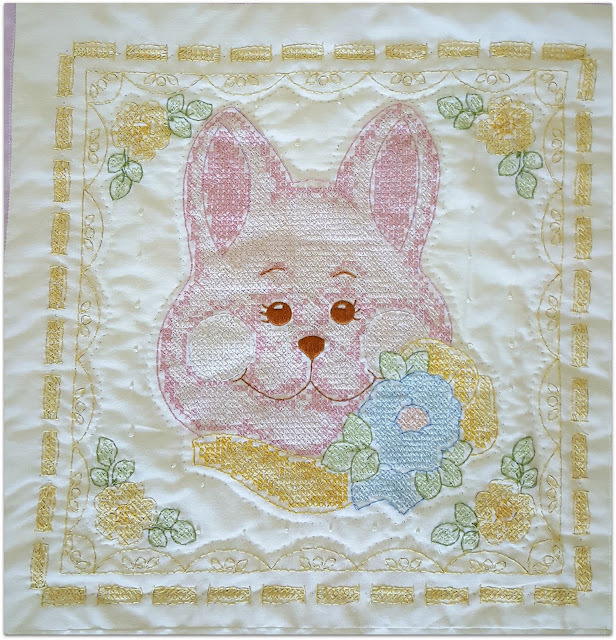 It brought back the happiest memories of my beloved Harrington bunny who loved to lay in the cabinet while I sewed. Well, that did it for me. I decided I was the one who was suppose to finish the quilt. I had to fix a few of the edges first before I could sew on the borders. When the borders where on, I started trimming down the sides getting the quilt ready for the binding. When I flipped it over, I noticed this small blood stain on the back. Immediately I thought about the woman who must have made this quilt and what she was thinking as she obviously pricked her finger with needle. 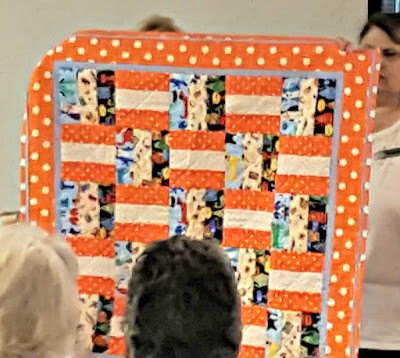 She probably thought the same thing I did, "Oh thank goodness it's on the part that will be cut off instead of on the front of the quilt!" LOL! 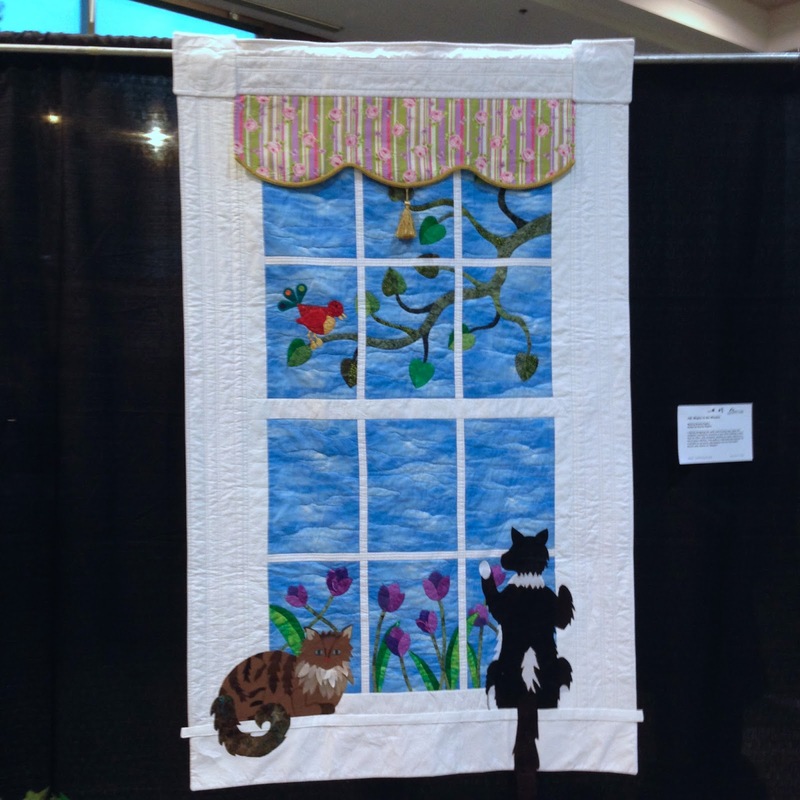 We have all been there in quilt world haven't we? 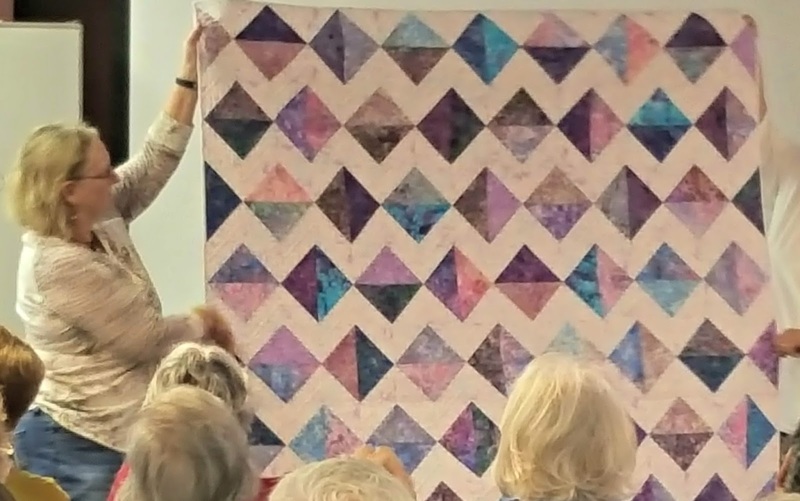 Jean was totally shocked when she came in and saw the finished quilt. She couldn't believe it. I told her the whole story and why I decided I needed to do it. She asked me if she should ask Tammy for some money for my time. 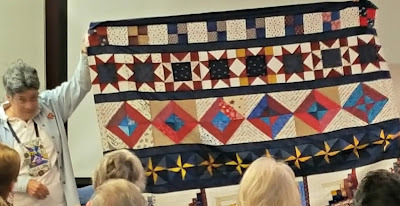 I told Jean what I would really love in return was the story behind the quilt. I really wanted to know more about the lady who spent all those hours stitching this quilt and why she never finished it. Jean called Tammy and told her I had finished it and what I wanted in return. Tammy wrote me the following letter. 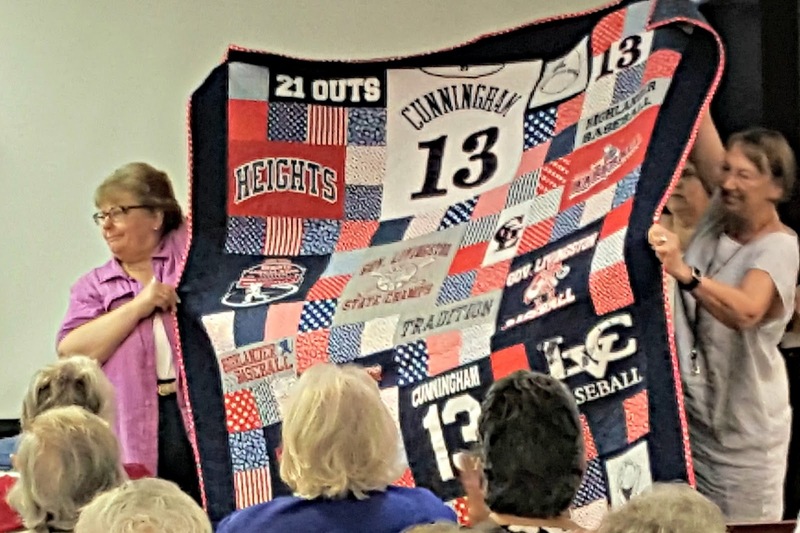 I cannot thank you enough for finishing this quilt! It has quite a story associated with it. Feel free to share the story with others. My mother, Mary, loved stitching. 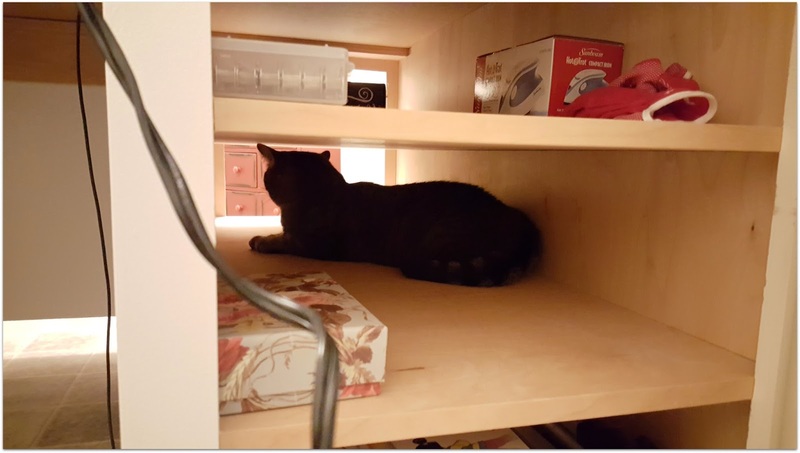 She found it very calming and meditative. 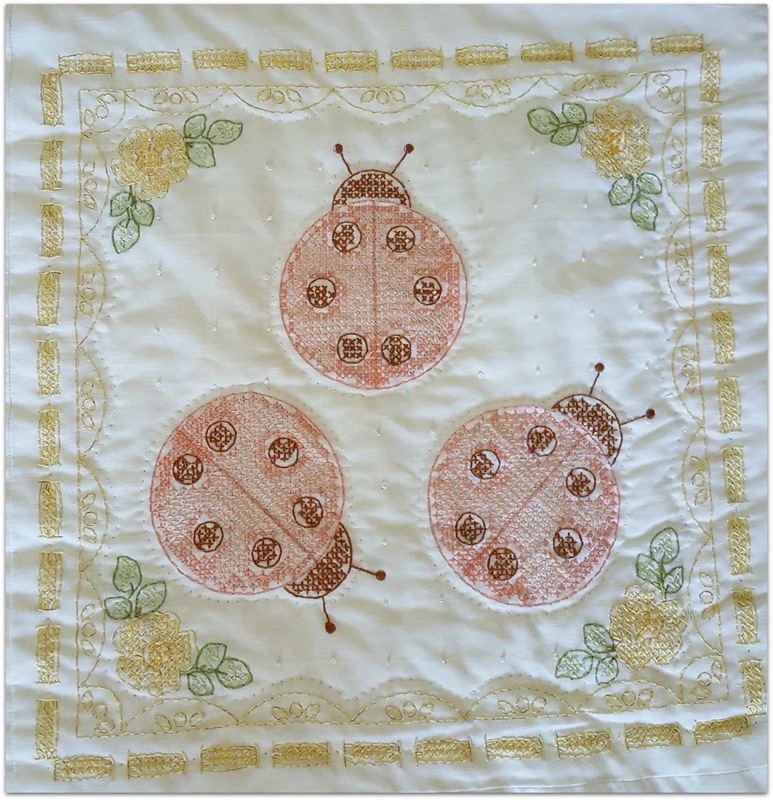 At first she made pillow cases for friends and family. 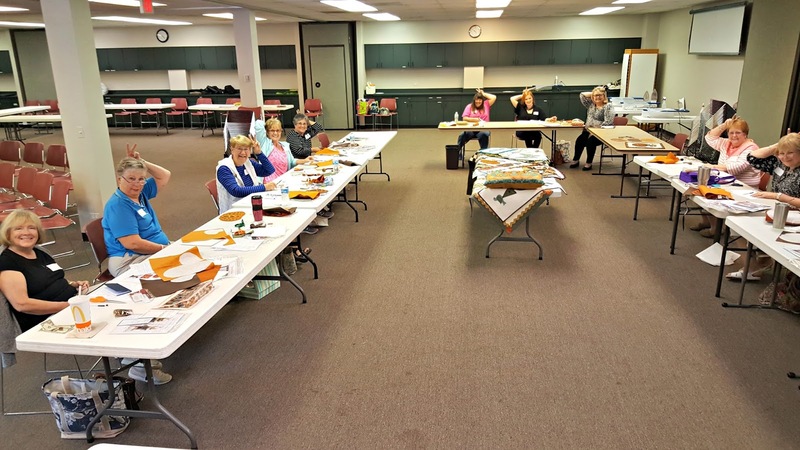 Picking out their favorite colors and stitching designs on their borders. She would often hand them out as presents to those she loved. She died 5 years ago. 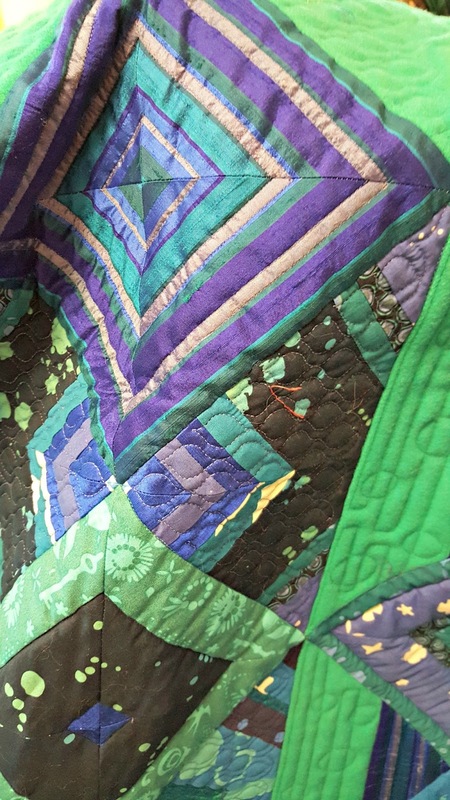 My father and I did go through some of her things when she died, but we did not come across the quilt. She must have been keeping it to herself to surprise her only granddaughter, Molly. Molly was a baby at the time, but my brother's only child. Years go by and then my father passed away in November. 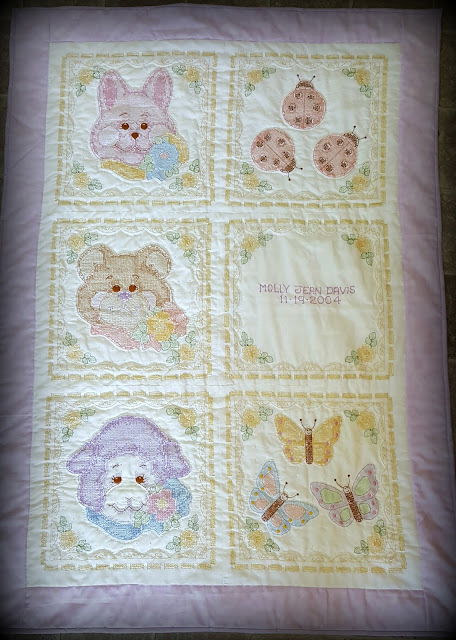 While going through his belongings, my husband and I found the quilt. You can imagine my surprise when we came across it! She had obviously spent a lot of time making it for Molly. Now thanks to you...Molly will now have the finished quilt that her grandmother so lovingly started so many years ago and never got to give. I know she is smiling down on us, thankful that her project is complete. I also know that Molly will treasure the quilt for her lifetime. I am glad that it was you who finished it because I am sure that the finishing stitches were also done with love. 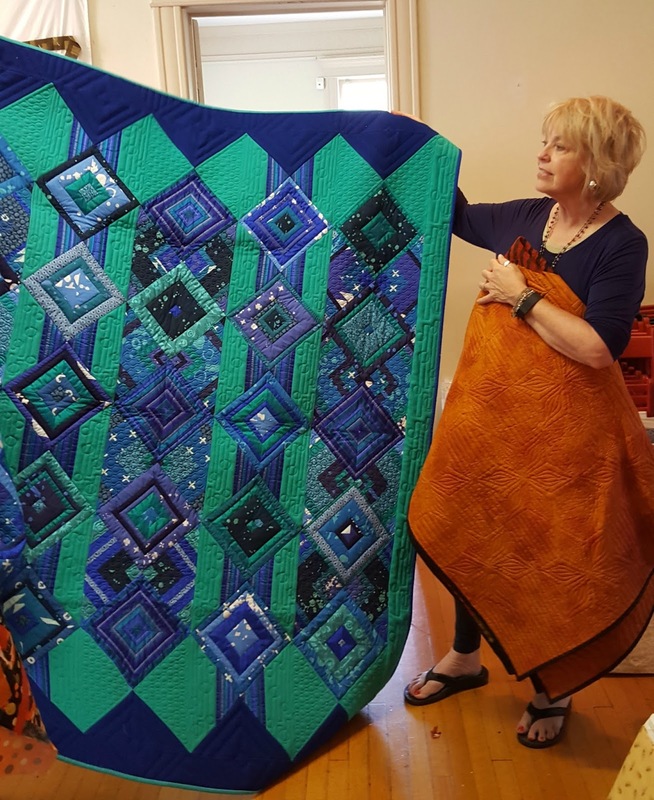 Making that quilt everything it was intended to be - a gift of love. I know you did not want anything for finishing it, but me and mom appreciate it and want you to do something special for yourself! As you can imagine, I was brought to tears with this letter. In fact, I cried again just now as I typed it for you. Tammy gave me a $100 bill for finishing it, money that will go towards my new website. I know in my heart, that Mary whispered to me through that quilt. It was a sweet and gentle reminder that I love what I do and even though chaos, sadness, computer crashes and financial worries come, there is nothing I would rather do than share my love of quilting and stitching with you. Helloooooooo! Well, my website had decided that after ten years it is tired and doesn't feel like working anymore. POO! 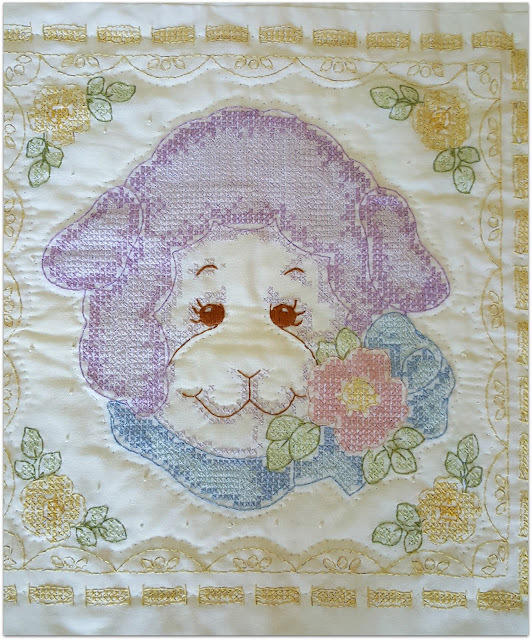 So, while the new website and shop are being constructed, please hop over to my Craftsy Shop to purchase any of my patterns (the bunnies and I would truly appreciate and be so very grateful for any purchase you make as the new site is over $2500.00! Yikes!!!) So, while the construction is going on, I thought I would share some more photos from my cottage. 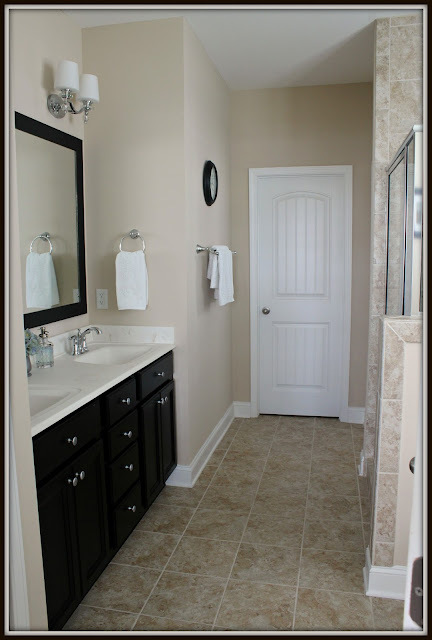 This is our master bathroom. We upgraded to a tile floor and a tile shower. I added plantation shutters on the windows. There is one above the soaking tub (aka Sabrina's tub because she plays with her toys in there) and one in the toilet room. I found these pictures at a local thrift shop for $20 and the colors were perfect! My color palette for this house is espresso (blackish brown), beige, brown, cream, blue and green. I feel they are perfect colors for my new design style, which is "Calm, Clean and Serene." I'm pretty happy with how it turned out. What do you think? See ya right back here next week!